Why am I telling you all this? Well over the weekend I was very excited to recieve an email welcoming my Cambridgeshire SQL Server User Group (Web|LinkedIn) as a new PASS chapter and I believe that the song very nicely sums up the way I feel about all of this. 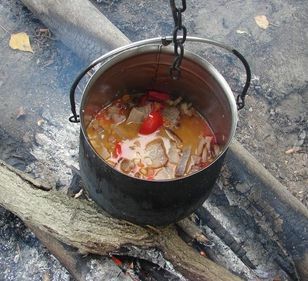 Not only is it fantastic news on the basis that being part of the larger community should help improve our ability to share the “food” in the cooking pot (knowledge) but will also enable the group to have more efficient lines of communication and rewarding social network allowing us all to smoke the metaphorical “Kouchie” together. I am hoping to arrange the next meeting for the SQLCambs user group over the coming weeks, so please keep your eyes peeled. If you live in or around the area (or even further afield) and would like to join us then we will be very happy to have you there. Finally I would like to thank SQLPASS for everything they have done for the SQL Community over all these years and I have been a big supporter of them from afar from the very beginning of their inception. Over the last few years I have had the pleasure of meeting several people who work tirelessly behind the scenes of the organization giving up huge amounts of their own time for the benefit of us all and words cannot describe how very pleased I am to be even more involved in this community. *1 Disclaimer: It goes without saying but just in case you are missing the humour, drug taking and working as a DBA (or any walk of life in fact) is (in my opinion) a very bad idea folks, please don’t do this! This entry was posted in Personal Development, SQLServerPedia Syndication and tagged Chapter. Bookmark the permalink. Thanks for the offer Colin. Allowing remote sessions during a user group meeting is certainly something I’d be interested in putting on and I will investigate if this will be technically possible for us -and when it is I’ll certainly drop you an email. By the way, I think I might have seen you in Seattle recently at SQLPASS. Kept thinking I knew your face but the lack of facial hair threw me!